I hope you enjoyed the Royal Blog Tour! 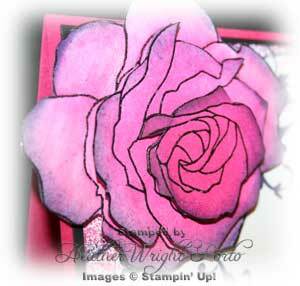 I am featured the beautiful Fifth Avenue Floral stamp set and the water-coloring technique. As promised, I mentioned I would be running a special on this set, Fifth Avenue Floral! It was on sale for the month of April at 20% off. But due to the tour's timing, it is now May and you will no longer get the discount from Stampin' Up! but I will give you my 20% discount!!!!! Email me to place your order! Many of you who regularly follow me know that I love roses, so how could I not feature this beautiful set! However, you will also notice I'm going outside my comfort zone using bright colors instead of my typical earthy/subtle/vintage tones (LOL). I am excited to share this "experiment" with you! Please leave a comment and let me know what you think! Wouldn't you just love a real purse like this? I would!!! 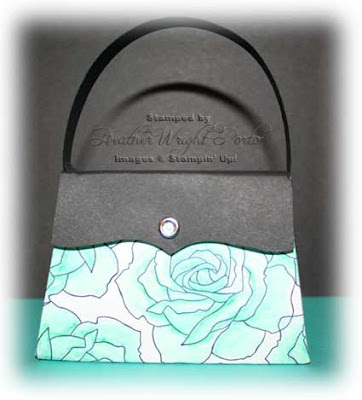 I stamped the large rose several times on Whisper White cardstock in Versa Mark, then covered with Black Embossing powder, then apply heat to emboss. Then each rose was colored using a turquoise/aqua pencil from the set of Watercolor pencils. A Blender pen was used to color/paint. Then I kept applying the pencil to edges to create the darker accents you see. Black paper was used for the top of the back using the Big Shot Top Note die. Then a Clear Rhinestone added to finish it off. In my next sample, I wanted to create a fun, bright Mother's Day card. 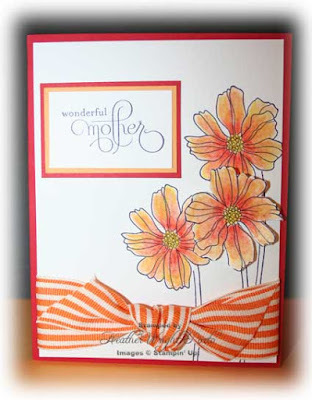 I used orange and red to accomplish this and again with the Watercolor Pencils from Stampin' Up! This card is simple, but I still love it! I stamped the lower and upper flowers in Basic Black first. Then the stems for both. Colored the two. Then, stamped the 3rd flower on scrap Whisper White paper, colored and cut it out. Then temporarily placed on the card and stamped the stem. 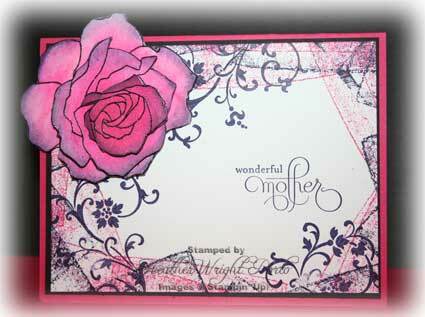 Then adhered the third flower with Stampin' Dimensionals to give it a raised look. Tied and knotted the Grosgrain Striped Orange ribbon around the panel, centered. Adhere panel to Real Red card. Greeting is stamped using the popular and beautiful Well Scripted stamp set. In my final card I stamped 3 roses with Versa Mark to emboss in Black (on scrap paper). Then colored all three of them. I used Daubers and Melon Mambo Class Ink to color them! I rubbed the Dauber in the ink and then started in the center (the darkest area) and continue to rub outward in a circular motion (where the edges and outer area is the lightest). Cut them all out in different layers, then sponged each layer's edge in Basic Black. Used Dimensionals to each layer to give dimension (see picture below). For the main Whisper White panel, I stamped the swirl from the new Elements of Style stamp set (from the Summer Mini to come out in May) in Basic Black. Then I used the Basic Black Classic Ink pad as a "stamp" and stamped it along the edges of the card in different directions. Yes, this is messy! Be sure to have your grid paper down! Then using Melon Mambo ink, did the same thing around the edges. Stamped Greeting in Basic Black. Then matted Whisper White on Basic Black paper, then mounted that on Melon Mambo card. Really FUN projects Heather!! Thanks for sharing.. and thanks for all your dedication during the Royal Blog tour.. You really earned your crown! Beautiful projects, Heather. You have really shown off this set nicely. Thanks for all your great work on the tour. WOW< WOW< WOW. Your projects are AMAZING. I love what you did with the pencils, now I have to drop everything and go and try this, lol. love the colors of the purse! Beautiful projects! I love that stamp set and your purse is just gorgeous! TFS! Heather--I knew your projects would be a WOW and they sure are! Each of them is fantastic--TFS them with us. Love your projects! How did you find time to stamp! Thank you so much for all you do including the monthly updates and your work on the blog tour. I love your projects... I love your site! I need to visit you more often! I love your comfort zone colors... these are nice too, but I'm more in line with your colors... great site! wonderful Projects just LIKE you ARE Heather! Great job. I never would have guessed it was out of your comfort zone. Love the last card! wow! Love your designs! I thought the Mother's day was my favorite, until I saw the last one. Gorgeous - every one of them! Thanks once again for all you have done to make our RBT a glorious success! Oh Heather, you've produced beautiful projects, as usual! I had fun writing your interview a few weeks ago. ;) Thanks so much for making our Path and the whole tour a success! Your cards are lovely. This is my favorite set and I really like how you have used it. I want to try the border you created - its just great!!! I just love this stamp set and what you did with it. Your work is gorgeous. Of course I love that stamp set (who doesn't, right?) and you've given me some more inspiration to use it. My favorite is the orange/red card. Very pretty set. I love the look of water colors! TFS! Heather, I am in awe! Thanks for sharing these beautiful projects! I have subscribed. The colors are beautiful. Love the purse and the rose card. Thanks for sharing your talent with us. Beautiful job. Super cute purse. Your projects are beutiful and creative. I'm impressed by the beauty they possess. I really want to express all of my THANKS to you for HELPING to get this tour off the ground.. Very beautiful projects... I love that purse!! I love the look of the stamp set. Yes, I would love a real purse like the one you stamped. Thank you for sharing your projects/cards are great. Heather: These are gorgeous. I love, love, love the purse. You are amazing. I can't begin to thank you for all your hard work on the committee. You are so unbelievably dependable! terrific projects, I love you watercoloring and I really like how you used the black stamp pad to decorate the borders for the last card! Amazing! Great projects. I love that set, but rarely use it. I need to pull it out and get inspiration from your projects! Thanks for sharing your talent on the blog tour! I loved your purse - so much fun! I also really liked your second card with the orange flowers...thanks so much for sharing!